So, I have finally got my studio in the shape I was hoping for. The majority of my supplies have been sorted and organized and I know where they are. I’ve been trying to get to this point for months, but the reason it has finally happened is that I got a copy of Julie Morgenstern’s book Organizing from the Inside Out three weeks ago, read it, and followed through. Morgenstern’s book was full of ideas and advice that really worked for me. She recommends planning and writing things down, talks about the many things that can get in the way of being organized, and offers a great way to think about the room or area to be organized. Then she gives you specific steps to follow in implementing your plan. One thing that was really different from any other method I have ever tried is the detailed analysis she has you do before you get started. She has a set of questions to work through before you do anything else, so I sat down and wrote out my answers. One of the questions is: what is already working? This proved to be a valuable question for me to answer for two reasons. First, it’s positive. As much of a disaster as I had on my hands, it helped me to realize that there were bits of organization I had put in place that were actually working. The second thing it did was encourage me to really try her ideas. It turns out that what was already working actually followed many of the suggestions she makes (like assign everything a specific home, group items by activity, and use an appropriate container). Finding out that I not only was doing something right, but that the things she was suggesting were already working for me made me much more eager to try her system. When it comes to planning, she looks at a room or area with a kindergarten class room in mind. In kindergarten, there are certain activities that happen in certain areas. Everything you need for that activity is located right there, in easy-to-use storage that makes clean up a snap. So I applied this concept to my studio. 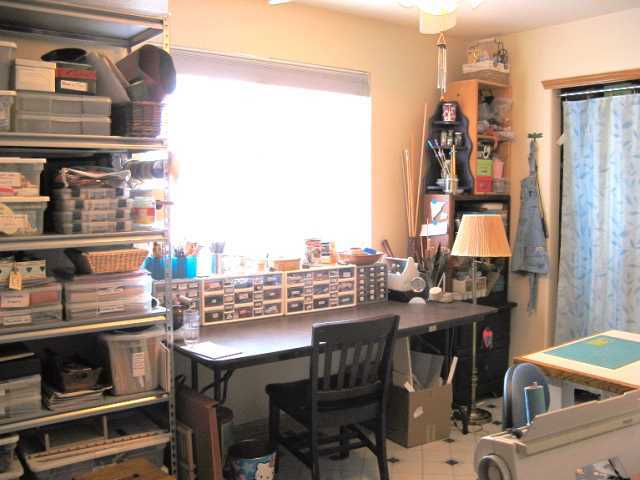 My studio has an overwhelming amount of material to deal with. I quilt, paint, draw, bead, collage, make books, and make art dolls. So I needed areas that would allow for the different sorts of things I do. I wound up with three “activities”: sewing (which includes cutting and ironing fabric), paper arts (drawing/painting/collage/bookmaking), and embellishing (beading and construction of dolls and their props). I decided to use my long work table for paper arts and embellishing, since some of my work combines the two. I put all the paper arts supplies on shelves off one end of the table, and the “embellishment” materials on the shelves at the other end. 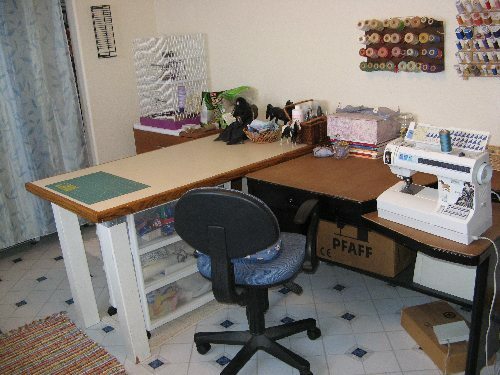 The other side of the room is sewing, with my sewing desk, cutting table, and notions storage. Having this plan really helped me when it was time to go to work.